Ambrosia may have been the drink of the gods, but for the modern man, there is no beverage more precious than coffee. It is the almighty coffee that helps young parents get up in the morning when the baby kept them up all night. It is coffee that keeps students alive during the exam week. It is coffee that helps us all function after a long night at the club. And it is the smell of fresh coffee in the morning that can put a smile even on the faces of the grumpiest nighthawks. However, while most humans like coffee in moderate amounts, for some people, coffee is a way of life and they simply can’t live without it. If you too have a crazy coffee lover in your life and you are looking for a cool gift for them, we have some excellent suggestions for you. A coffee lover can never have too many coffee mugs, and most people love personalized mugs. In fact, most coffee lovers have several cups with different messages and the cup that they choose usually matches their daily mood. You can find some very funny coffee mugs on the darngoodyarn.com website. These cups are ideal for all coffee lovers, but there you can also find special cups for pet lovers, for knitters, and for moms. If you can’t find a message that matches the personality of your friend, you can always buy a simple mug and have it printed with the message of your choice. Any coffee addict owns at least one coffee maker, but there is always room for more, especially if you buy them something special that they don’t already own. If your budget allows it, you can’t go wrong with an espresso machine. A portable coffee maker is also a good idea so that your friend will never find themselves without their poison of choice, whether they are out camping or stuck in traffic on the highway. And if you really want to take things to the next level, consider the Tea TopBrewer, a coffee crane built into a countertop. It is basically a tap that pours coffee instead of water. Not that normal coffee would ever need any improvements, but it is always nice to try something new, and we are sure that your friend will appreciate a gourmet coffee gift box with coffees from all over the world. Any type of coffee inspired jewelry would make a java addict happy, but if you are looking for a less than an ordinary gift, consider a necklace with a caffeine molecule pendant. You can also choose a resin bangle with real coffee beans integrated into the resin. 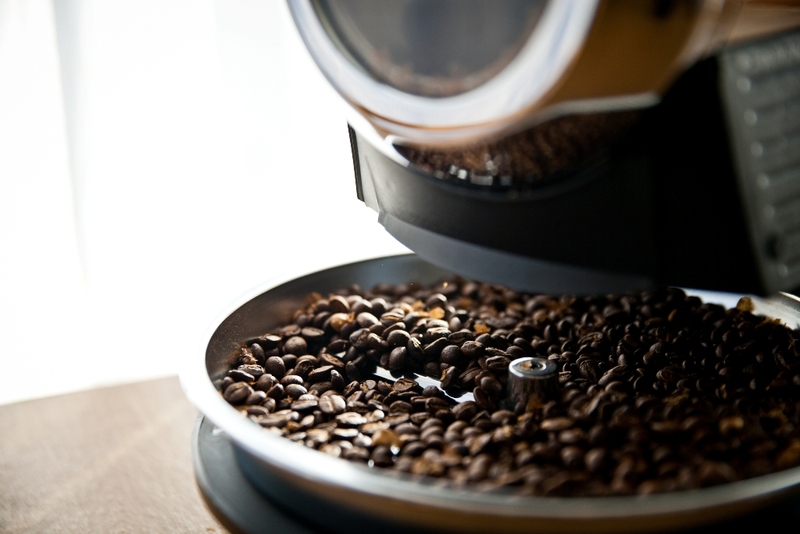 While roasted coffee smells quite good, the powerful odor can really stink up a home. To avoid such unpleasant situations, you could give your friend an electronic coffee roaster, so that they can roast their coffee to perfection, in a stink-free manner. Turkish coffee is one of the best types of coffee in the world. However, while the Turkish coffee itself is quite delicious, it is the Turkish ritual that makes this coffee special. It really doesn’t taste the same if prepare it in a classic kettle and you drink it from a normal cup. So, give your favorite java junkie a Turkish coffee set including traditional Turkish cups and saucers, a copper coffee pot and the best Turkish coffee. We all love to know more about the things that we love, so a coffee encyclopedia will make for a perfect gift for any coffee junkie. You can find numerous such books online, each one approaching different topics of interest. We personally recommend the World Atlas of Coffee: From Beans to Brewing. This book focusses on the brewing methods used across the world, so it will be a great tool for your friend to experiment with different coffee flavors. When your trying to buy your gift online making sure you organize a trusted courier is absolutely essential. why not try finding a bike courier they are becoming more and more popular in recent months.